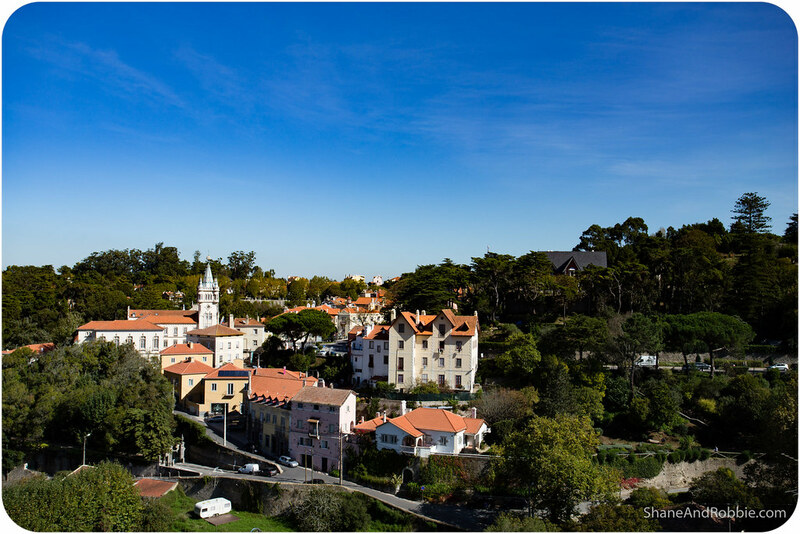 To escape the heat, every year the nobility of Portugal would retreat from Lisbon and go to Sintra for the summer. 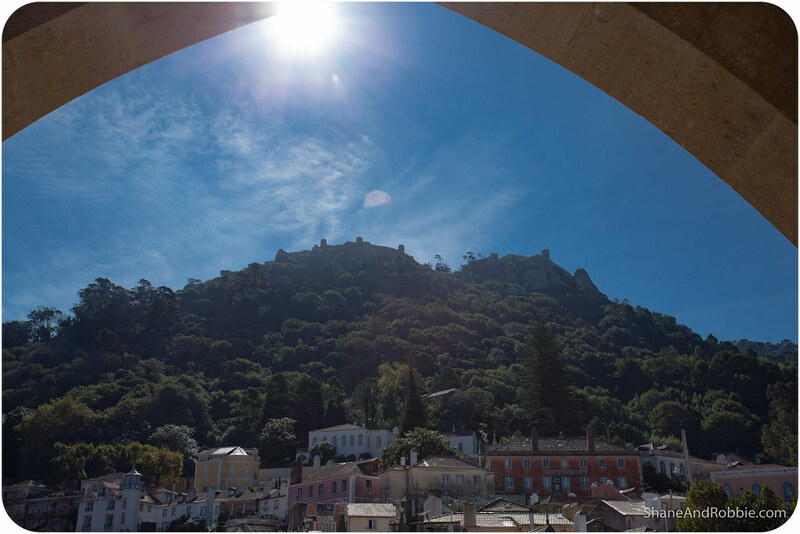 They built palaces in amongst the hills and forests of Sintra, transforming this small town into a wonderland of castles and magnificent manors. 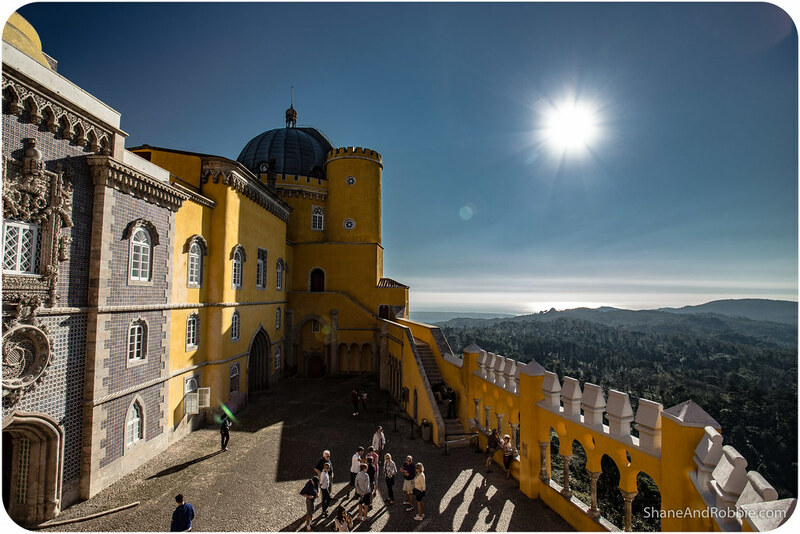 Located just 45 minutes West of the capital by train, Sintra is today one of Portugal’s top tourist destinations, and with good reason: there are no fewer than 6 major palaces to visit, as well as acres of gardens and forest to explore. 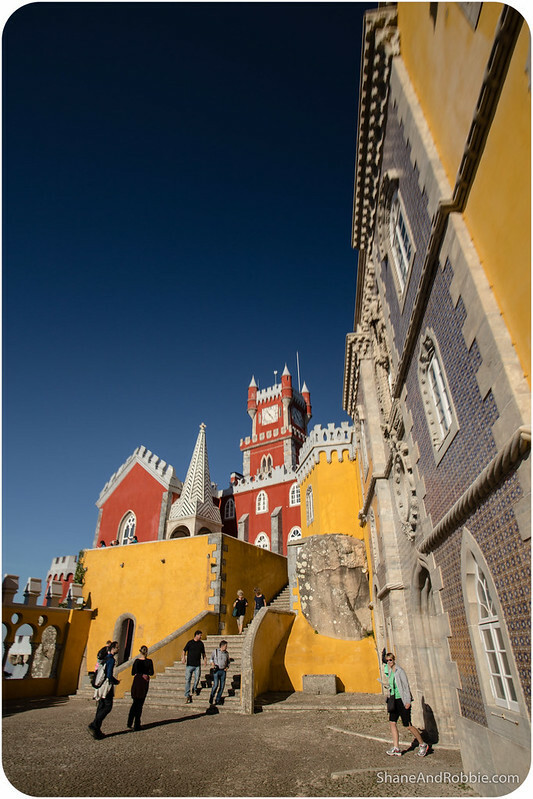 We love a good palace and so joined the hordes of day trippers in Sintra today. 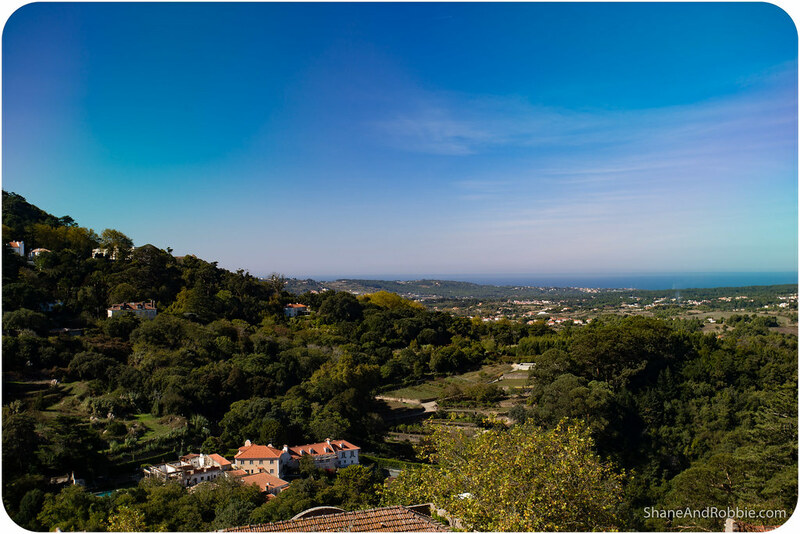 The Sintra Mountains rise abruptly between out of the vast plain to the North of Lisbon, winding their way towards the Atlantic Ocean and Cabo da Roca, the most Westerly point of continental Europe. 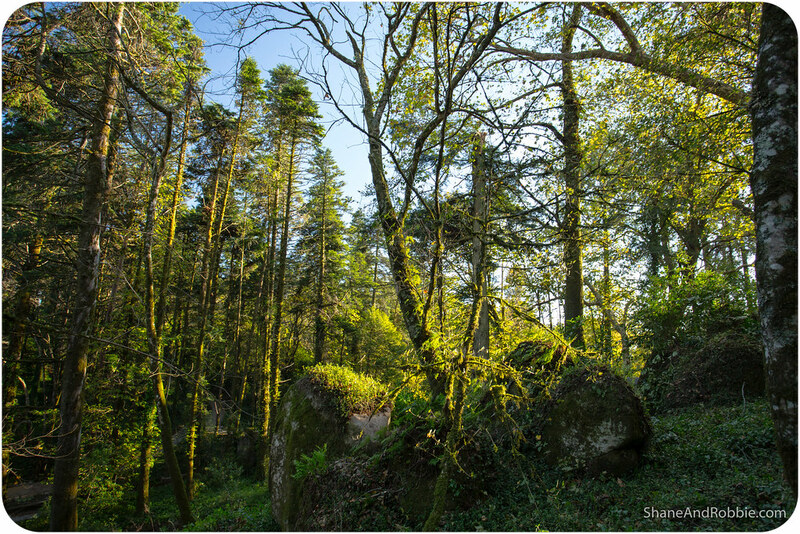 Evidence suggests the pre-Roman inhabitants of the area considered these hills to be sacred – home to mystical spirits and special energies. 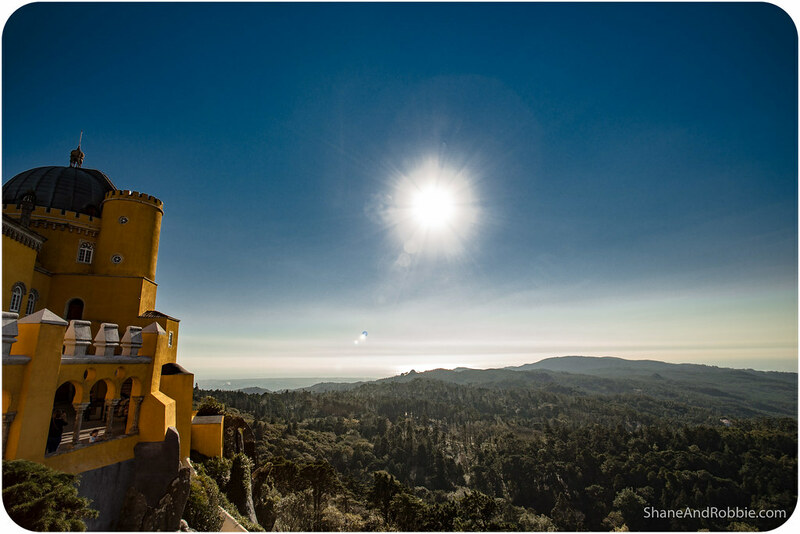 If nothing else the mountains are special because they have their own unique microclimate; much wetter than the surrounding arid plains, Sintra is often enshrouded in mist and is much greener than its surrounds. 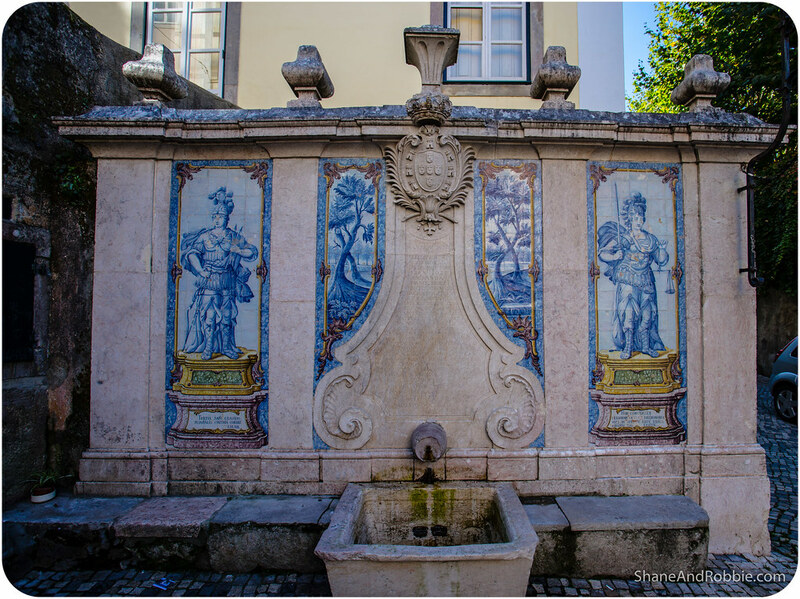 During the 19th century Portugal’s nobility took advantage of this microclimate and planted vast forests of trees, ferns, and conifers around their summer palaces. 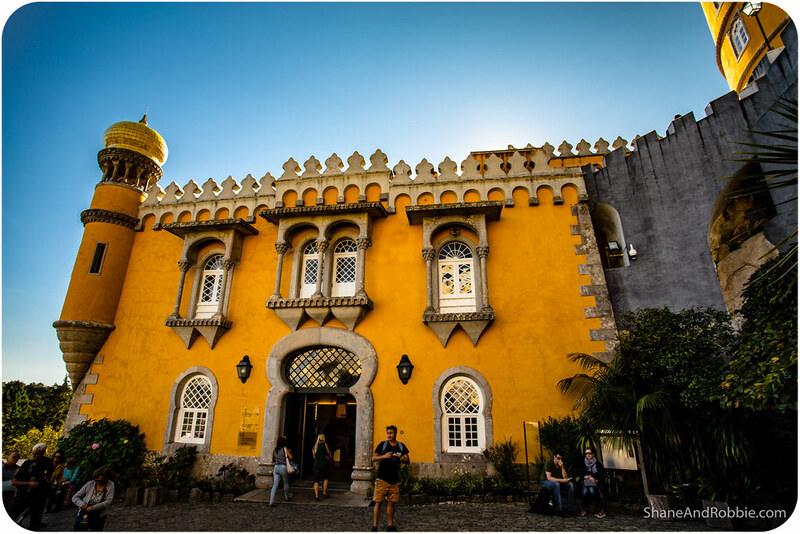 The end result is a verdant UNESCO World Heritage Site packed with palaces and a with a rich botanical diversity. 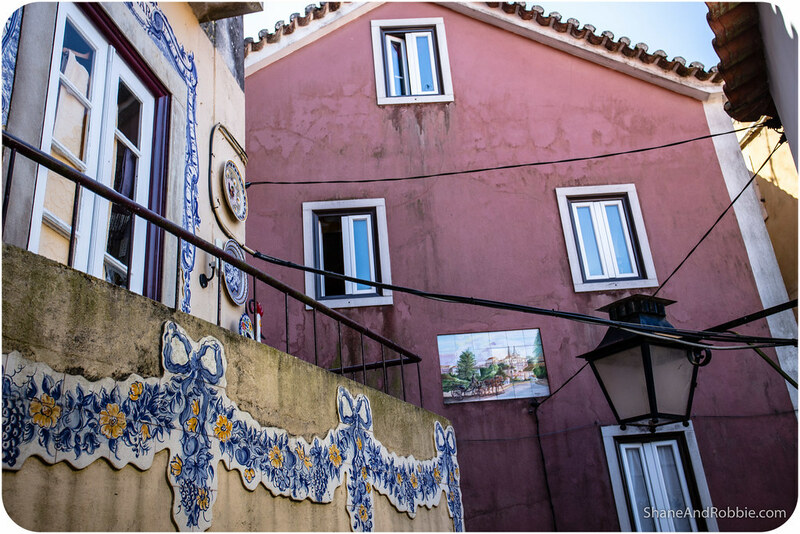 There is so much to see in Sintra that you really need 2-3 days to see it all – not least of all because the palaces are very spread out and the terrain is steep, so it takes time to get between sites (either on foot or using local buses). 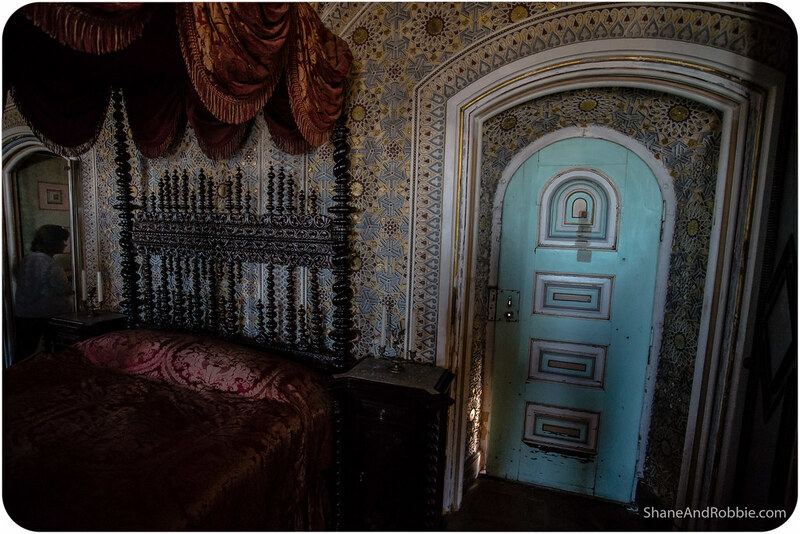 Rather than rush through the palaces, we chose a couple to see and focussed our attentions on those. 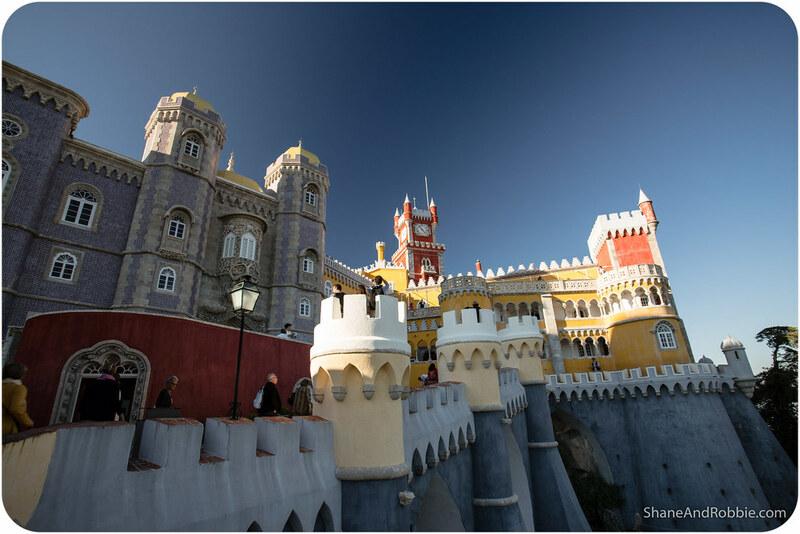 Our picks: the National Palace and Pena Palace. 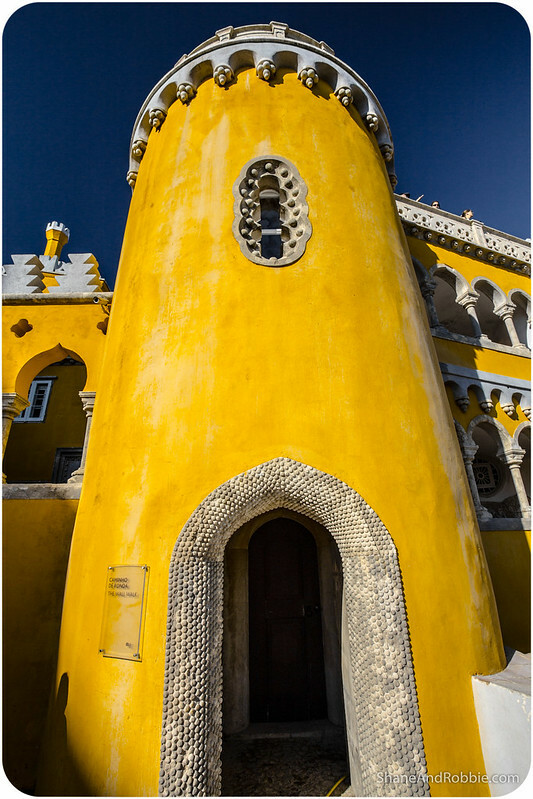 The National Palace is right in the centre of Sintra town and is the oldest of the summer palaces in Sintra – parts of the castle date back to the early 10th century. 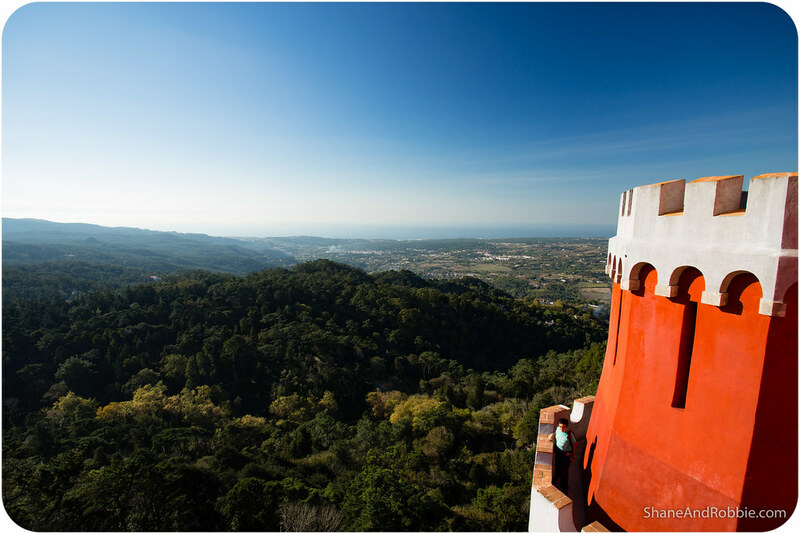 The 1,000 year history of this castle began during the Muslim occupation of the Iberian Peninsula. 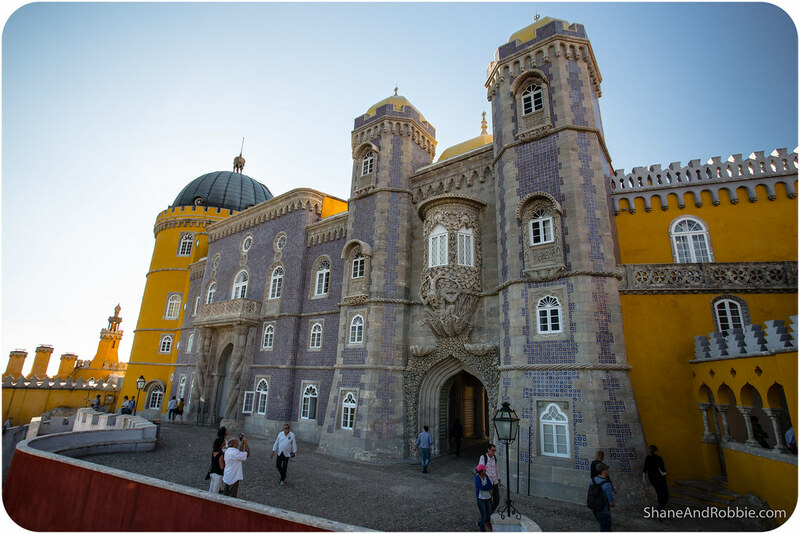 At this time Sintra had 2 castles: a defensive one known today as Castelo dos Mouros*, and a “pretty” one, which forms the core of today’s National Palace. 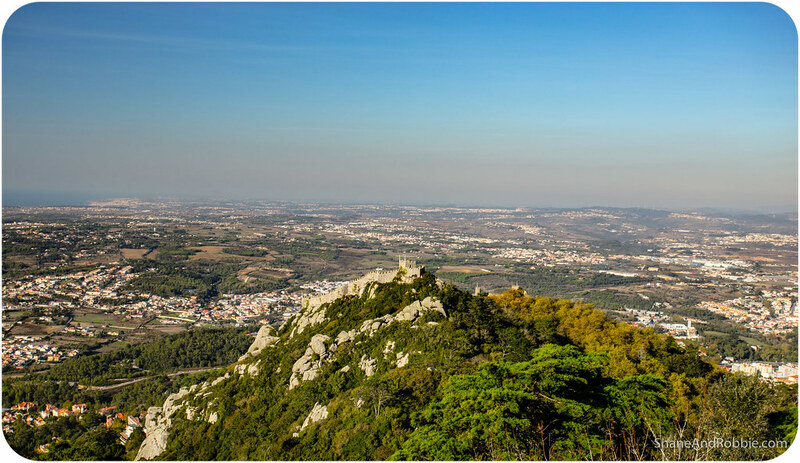 *The ruins of the Castelo dos Mouros were clearly visible, perched high on the hill above Sintra town. We had hoped to explore this rather epic looking fort today, but ran out of time. 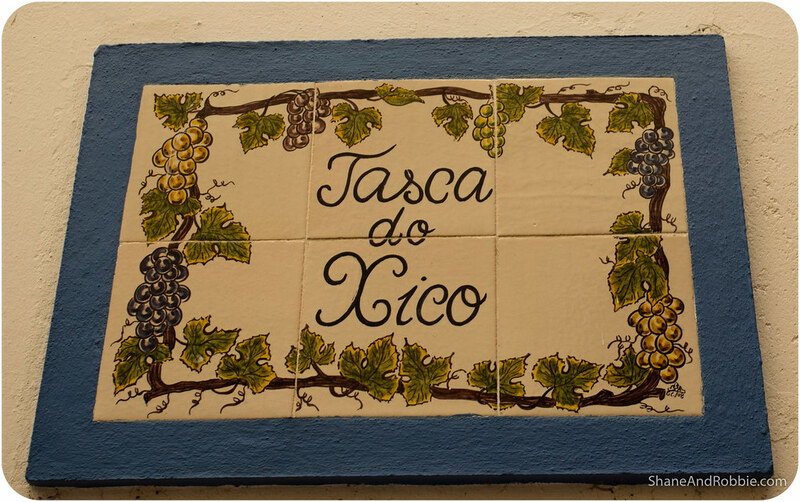 Ah well – just another reason to get back to Portugal one day! 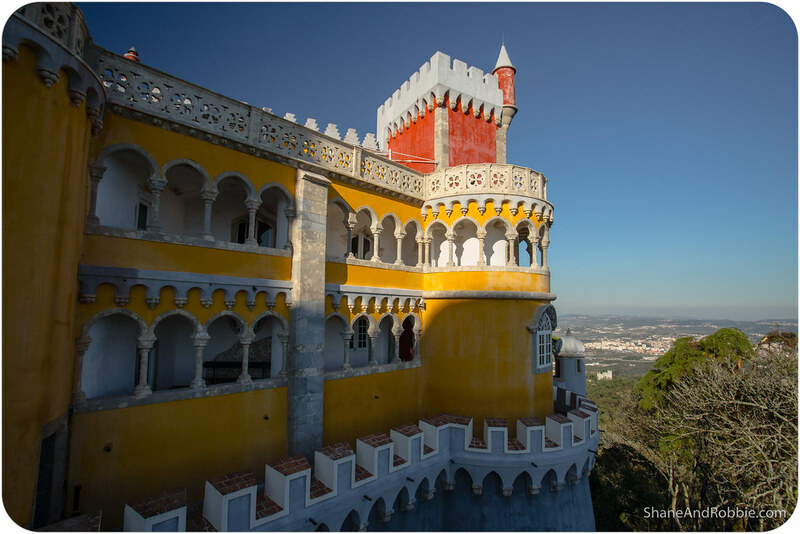 Both Moorish castles became the property of the Portuguese Crown after the conquest of the city of Lisbon by Afonso Henriques, the first King of Portugal, in 1147. 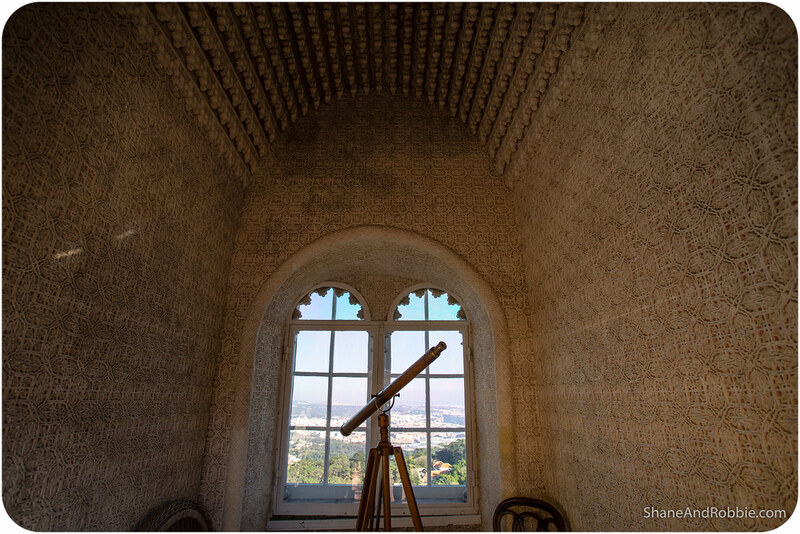 The king quickly realised the advantage of having a summer palace high in the hills and soon renovations were carried out to extend the palace and make it a little less obviously Islamic in appearance. 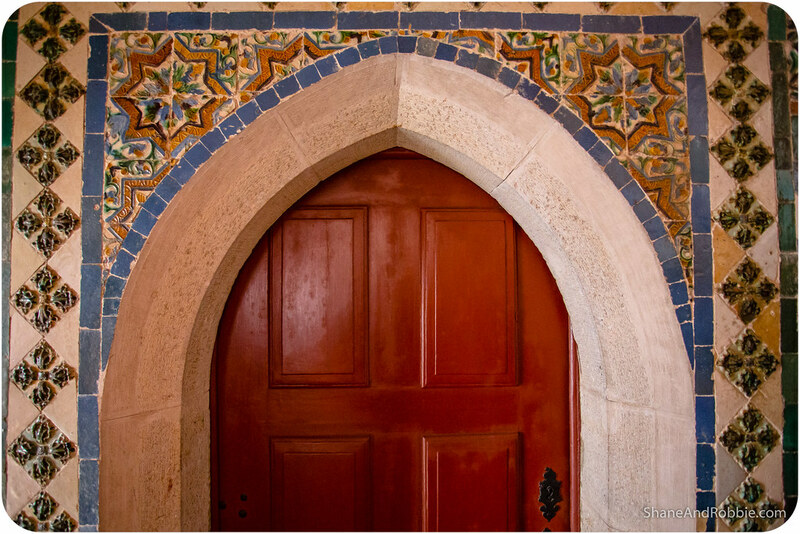 Despite repeated alterations over the centuries, however, the Moorish heritage of the building is still apparent. 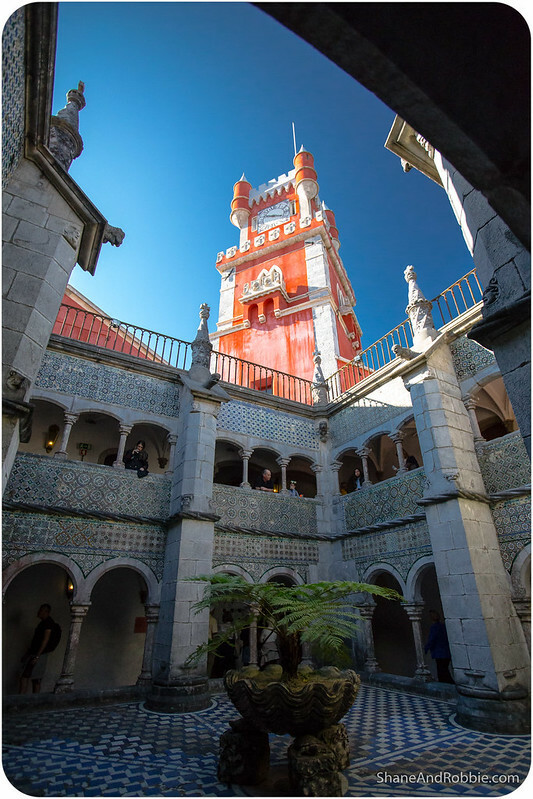 The vertical arrangement of its spaces; the intimate interior courtyards; the windows with their surmounted arches; and the walls covered in glazed tiles with rich geometrical patterns, are all features that underline the origins of the National Palace of Sintra. 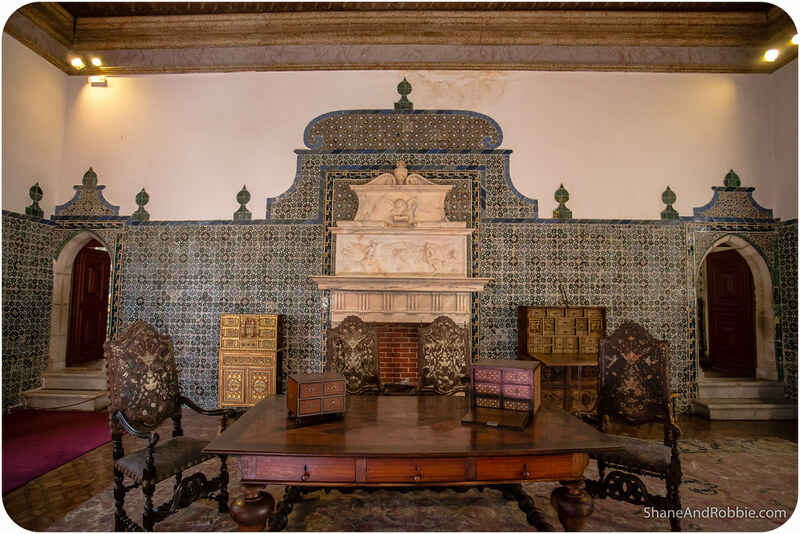 It was fascinating seeing the blend of Gothic, Manueline, Moorish, and Mudéjar* styles in the palace. 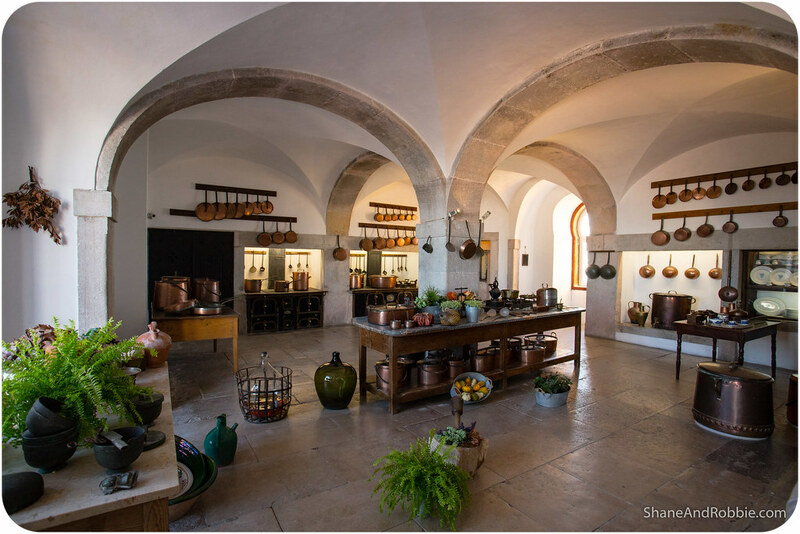 Our favourite room was the kitchen, where huge pots, ovens, and fire places gave an indication of the sorts of feasts that were once prepared there. 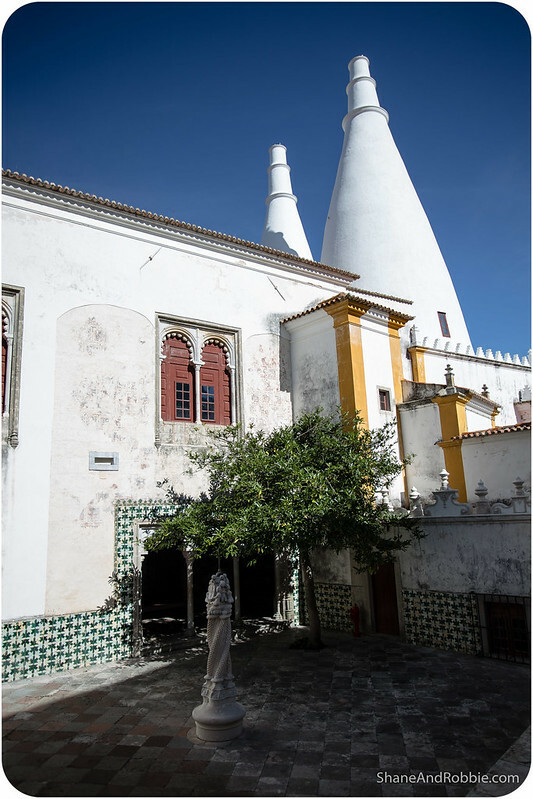 From inside the kitchen the function of the palace’s iconic, large conical chimneys became apparent too (i.e. to create suction to allow smoke to be sucked out of the kitchens and to create convection for circulation of heat). 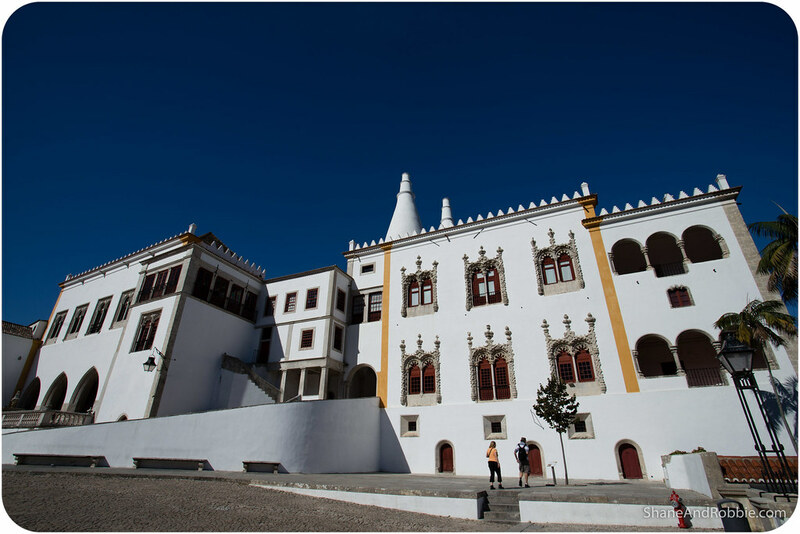 *A style of Iberian architecture and decoration seen in Portugal and Spain strongly influenced by Moorish aesthetics and craftsmanship. 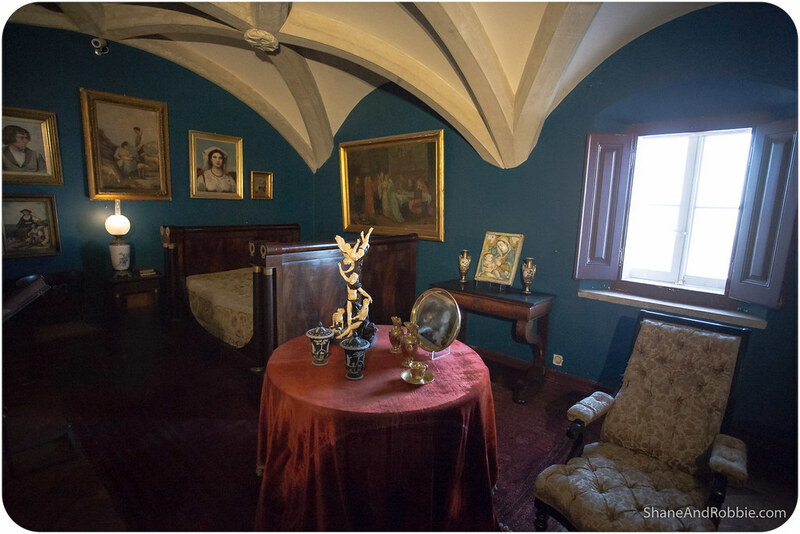 Other rooms that we liked were the chapel, the Swan’s Room, and the Coats of Arms room. 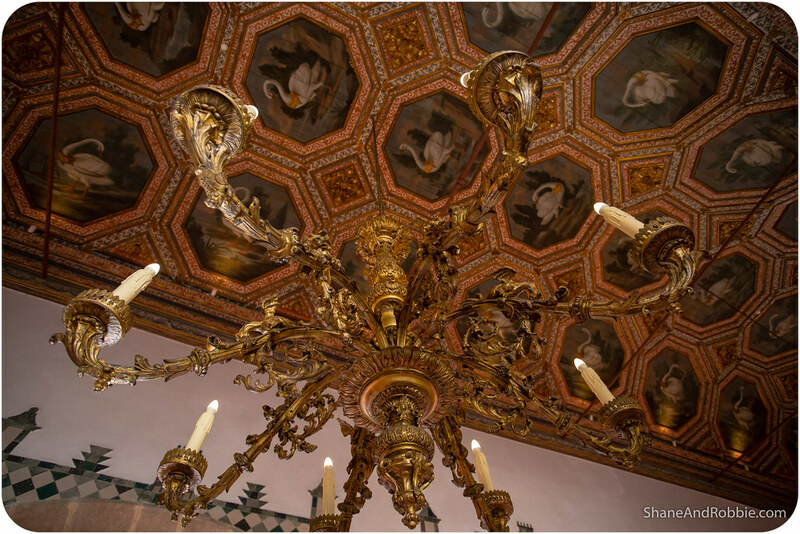 The Swan’s room is named for the swans painted on the ceiling and was once the great hall. 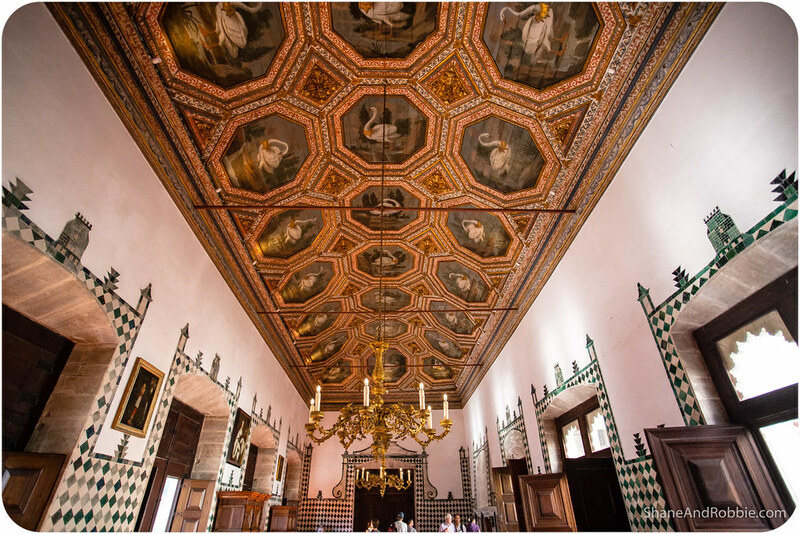 As the largest room in the palace this is where receptions, banquets, and major ceremonies were held. 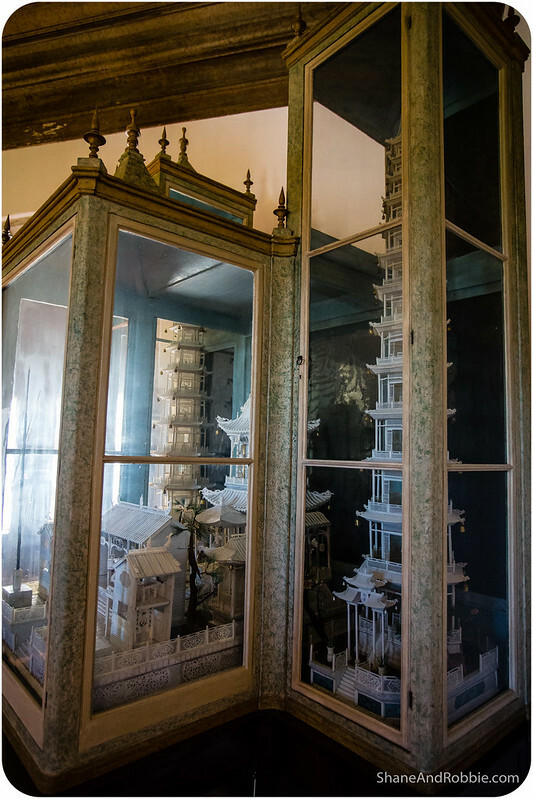 Among the decorative art on display in this room was an ivory Chinese pagoda, gifted to the Portuguese royals by their subjects on Macau during the 18th century. 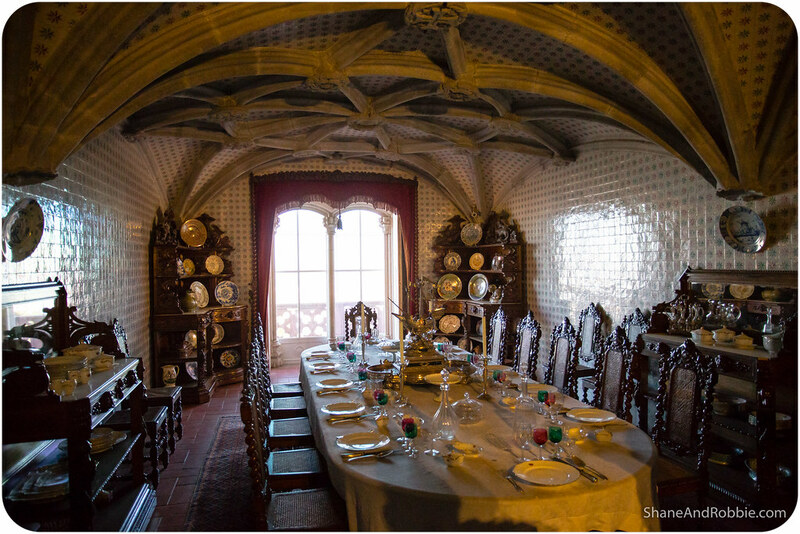 The Sala da Brasões, or Coats of Arms room, was by far the most impressive. 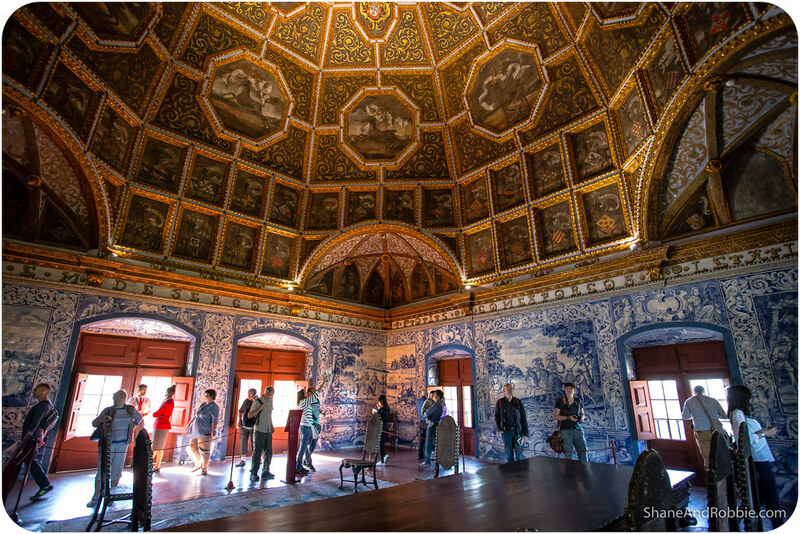 The domed ceiling of this majestic octagonal hall is embellished with stags clutching the coats of arms (brasões) of 72 noble Portuguese families. 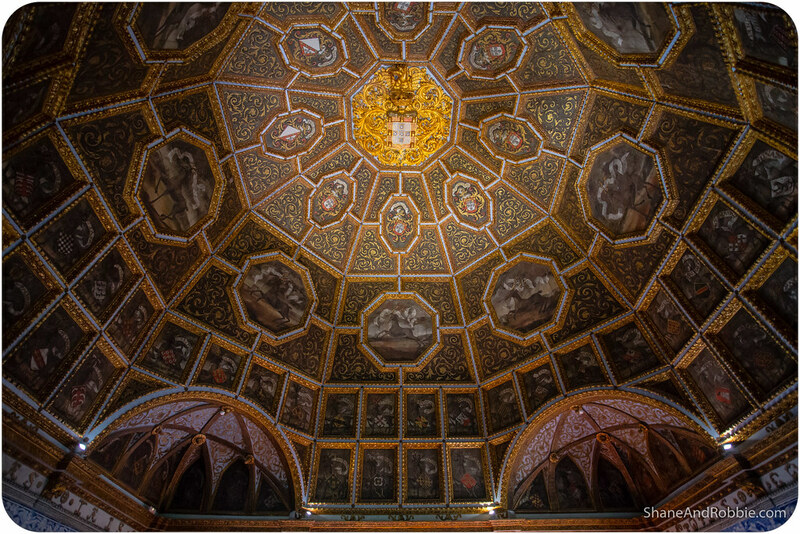 The heraldic shield of King Manuel I, who had the room decorated in the early 16th century, is positioned in the centre of the ceiling. 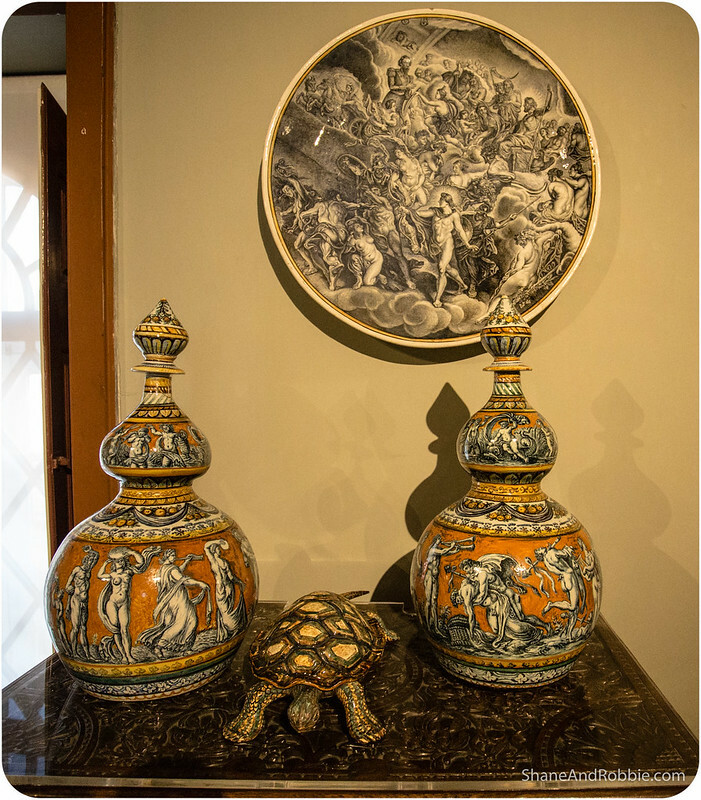 Blue azulejos tiles depicting hunting scenes adorned the lower walls, adding to the rooms overall grandeur. After touring through all the rooms of the National Palace we stopped in the village for lunch. 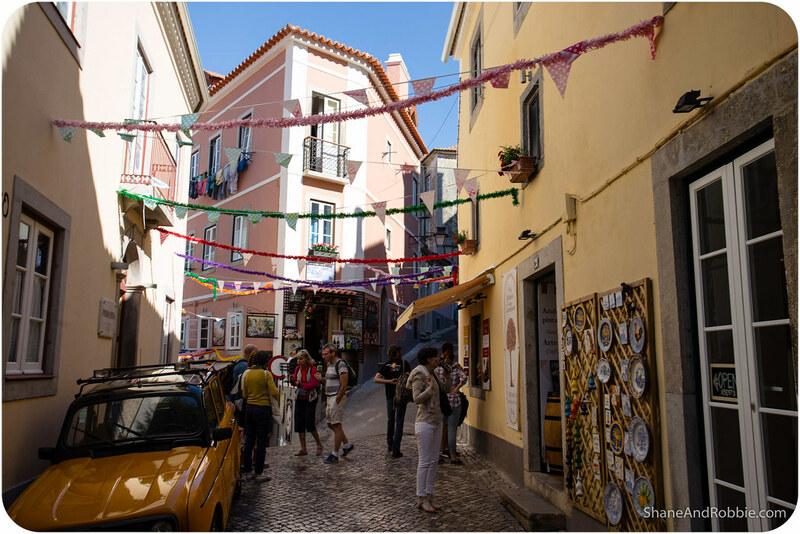 The narrow cobbled streets and multi-coloured buildings were very charming, though the whole town was very touristy (i.e. every shop was either a souvenir shop or a café aimed at tourists). 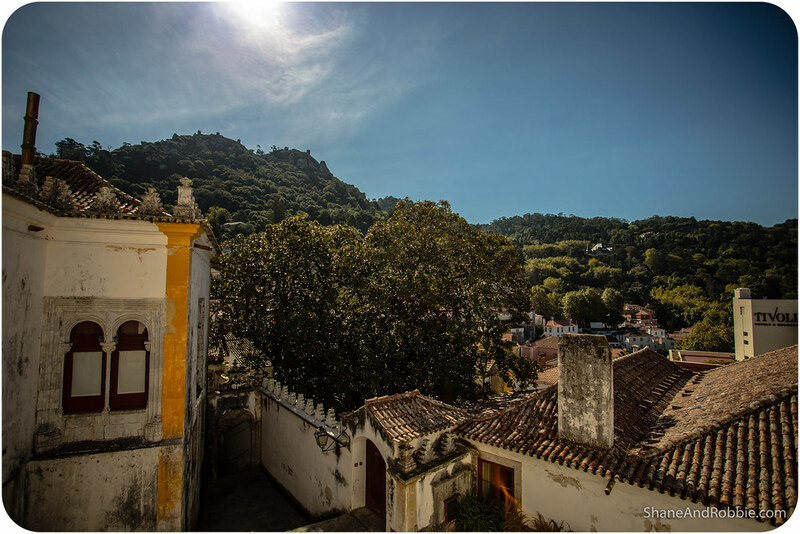 A few streets away from the touristic heart of town, however, prices dropped by half and the “real” Sintra emerged. Here we found a quiet spot for lunch, coffee, and one of the town’s signature dessert: a travesseiro*. *“Travesseiro” means “pillow,” and these delicious dough pillows were filled with a divine almond and egg custard. 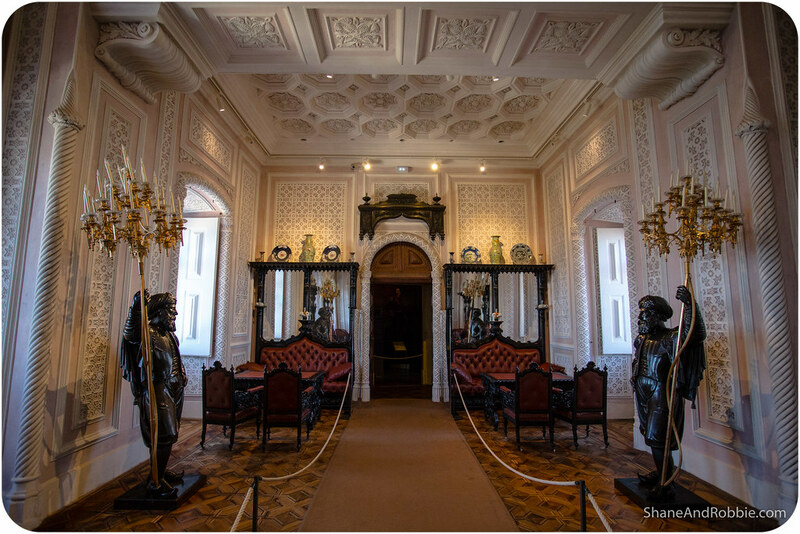 Refuelled and replete we set off to explore our second palace for the day: the Palace of Pena. 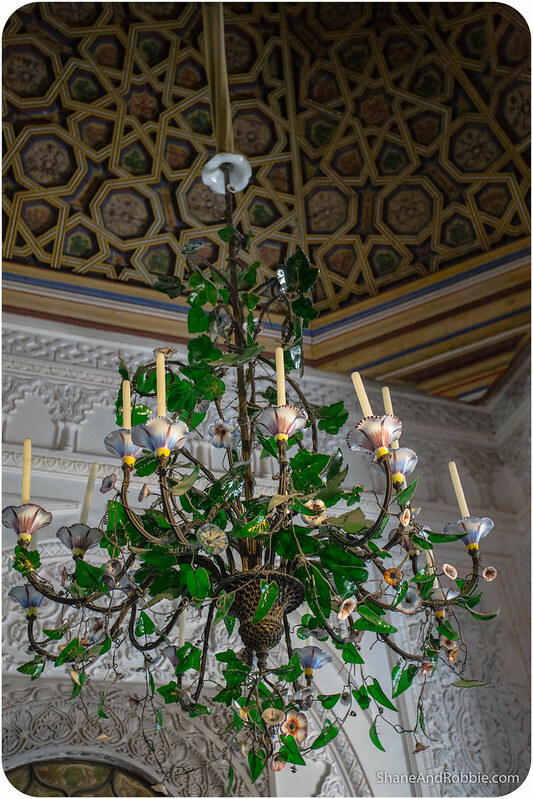 Looking like something out of a Disney movies, this multicoloured creation was built in the 19th century by the German-born King-Consort Ferdinand. 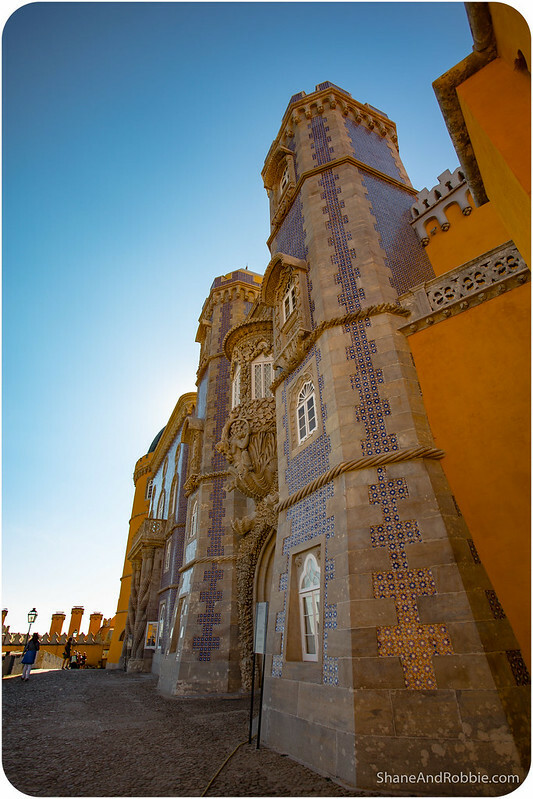 With its over-sized crenellations and mish-mash of architectural styles, Pena Palace looked like some kind of giant, surreal toy. It was awesome! 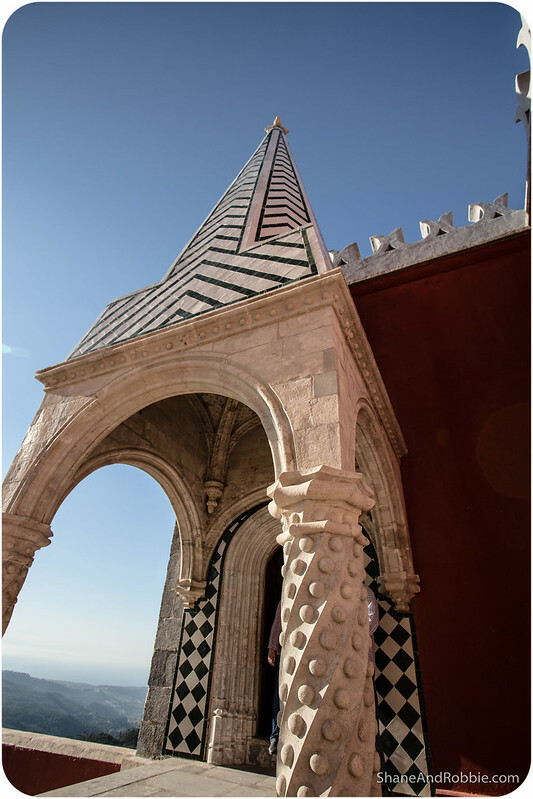 The palace’s history can be traced back to the Middle Ages when a chapel dedicated to the Virgin Mary was built on the top of the hill above Sintra. 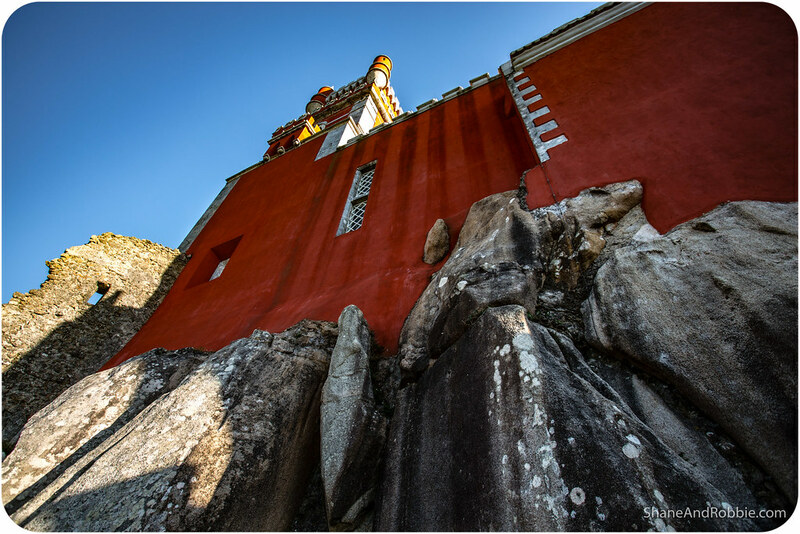 A monastery was built on the site in the 15th century and for centuries Pena was a small, quiet place designed for meditation and communing with nature. 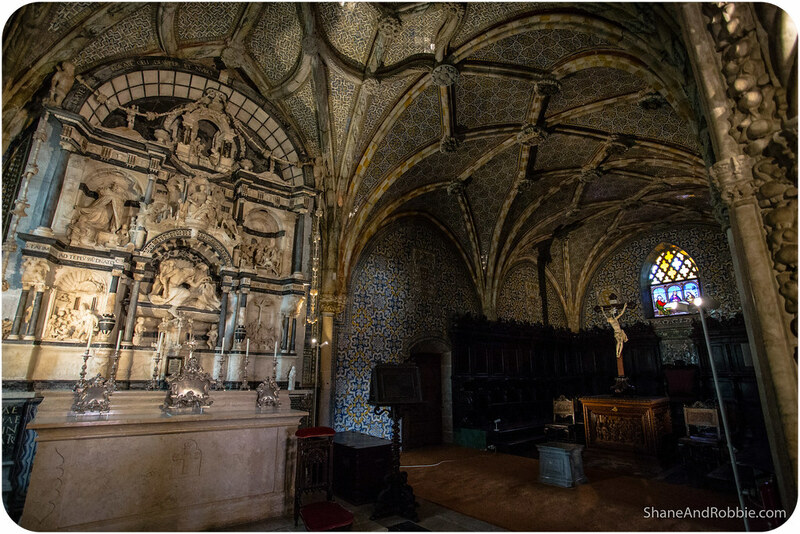 In the 18th century the monastery was severely damaged by the great Lisbon earthquake, reducing it to ruins. 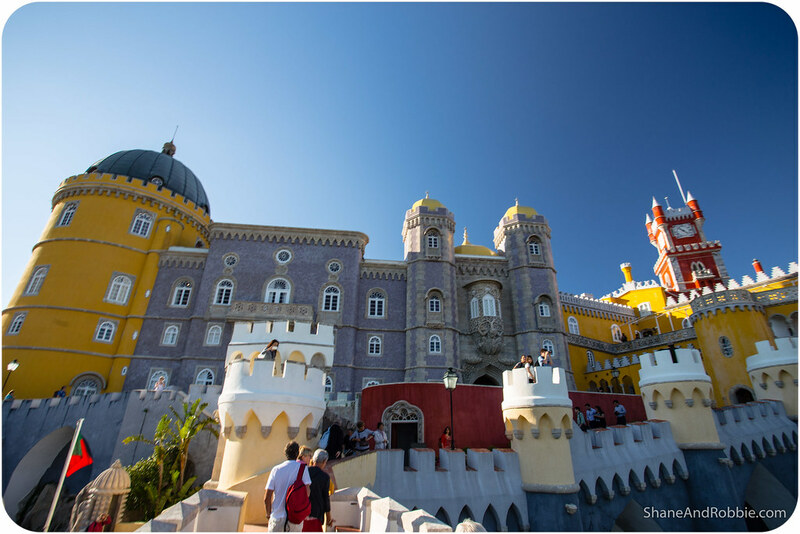 In 1838 King Consort Ferdinand II, recently arrived in Portugal from his German homeland, decided to acquire the old monastery and all of the surrounding lands, transforming the remains of the monastery into the glorious Pena Palace. 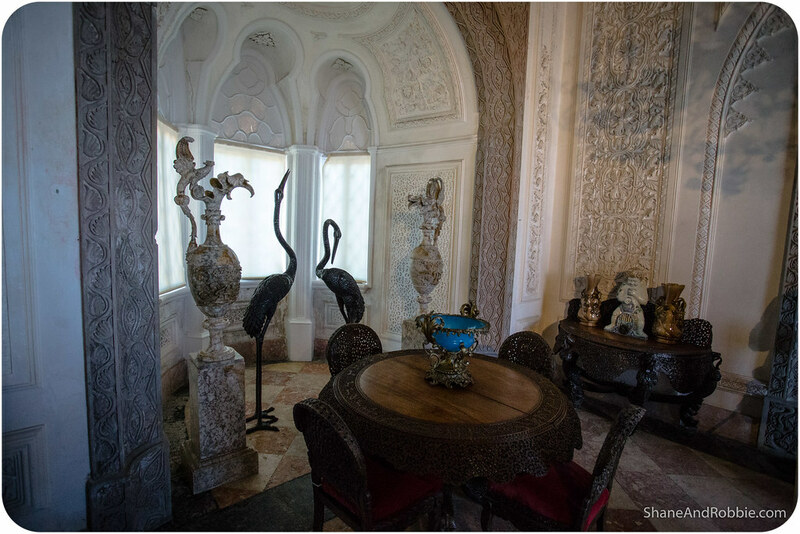 Touring through the rooms of the palace was equally fascinating and hilarious, given the mixture of decorative styles. 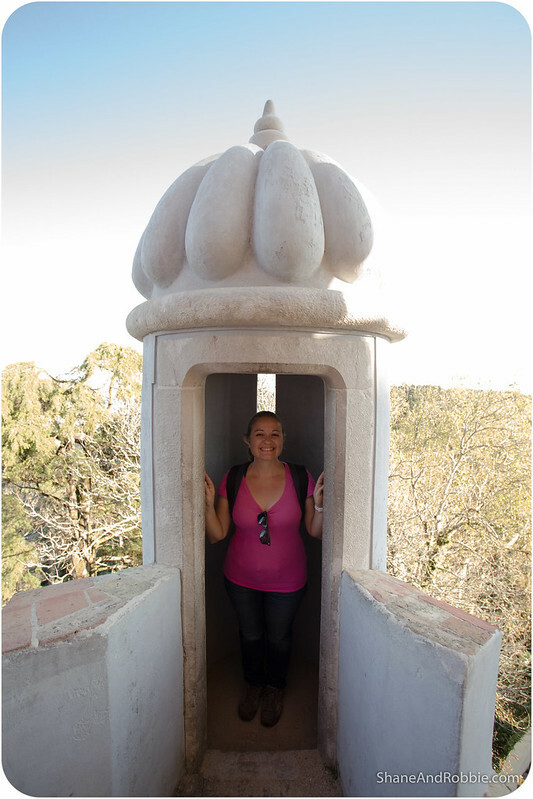 Pena is one quirky palace! 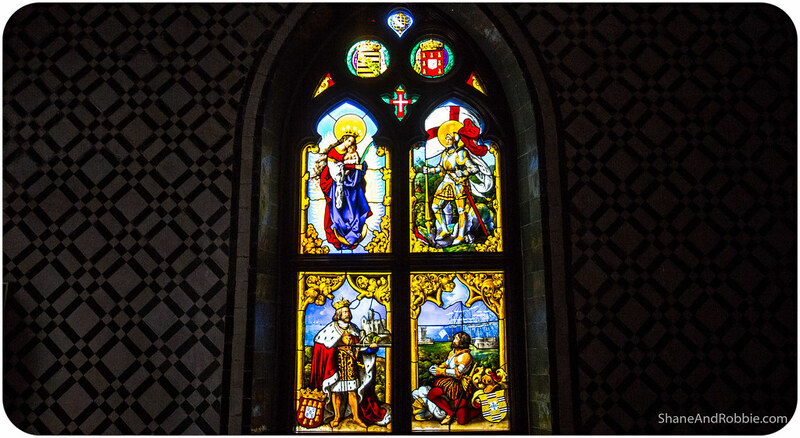 The nicest part of the interior were the preserved remains of the monastery, which had been converted into private rooms for the King-Consort and his wife, Queen Maria II. 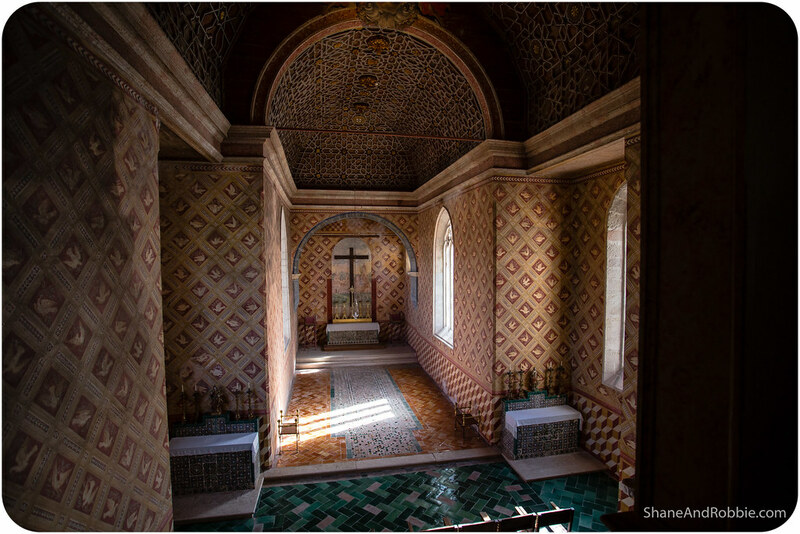 The chapel was also lovely, combining Islamic decorative arts with Christian themes to create a beautiful, evocative space. 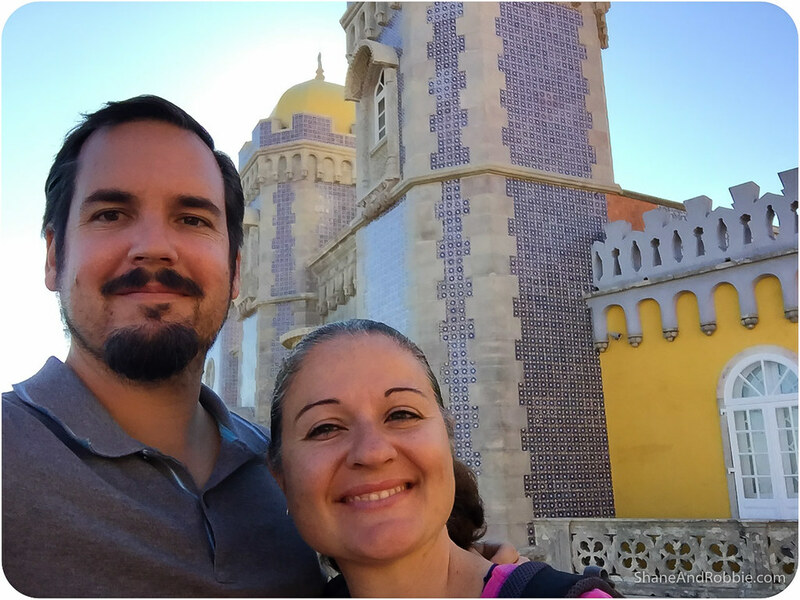 We spent ages walking through the palace and around its perimeter, enjoying the glorious views across to Sintra, Lisbon, and the Atlantic coast. All around the palace is the vast Pena Park. 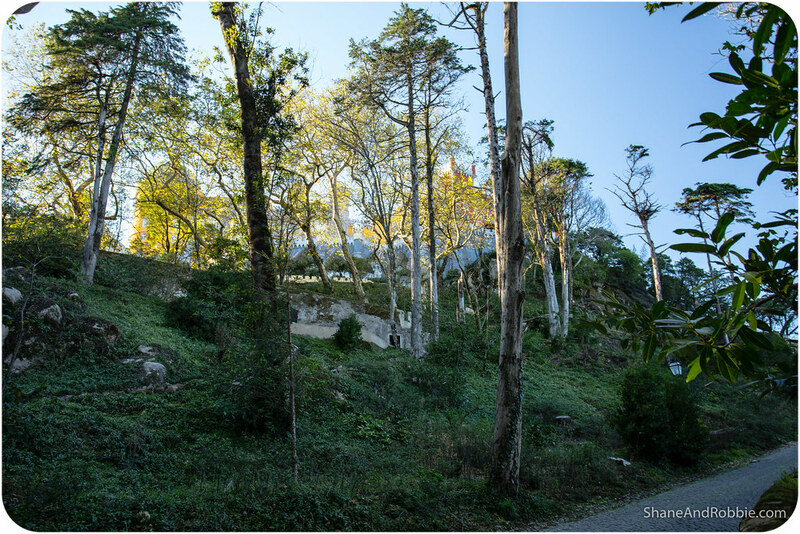 Ferdinand’s exotic tastes were applied to the park as well, with trees from diverse, distant lands intentionally planted across the hillsides to create a garden like no other. 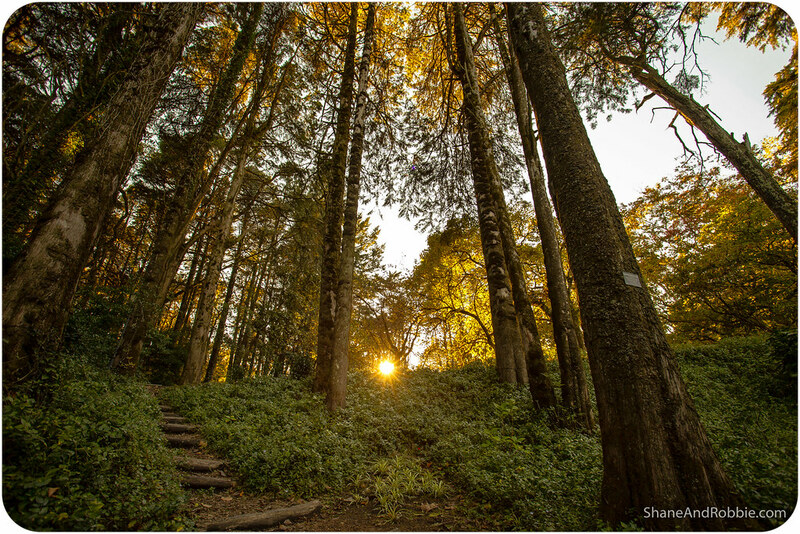 Walking through the park we came across North American sequoias, cedars, cypress trees, Chinese ginkgoes, Japanese cryptomerias, and a wide variety of ferns from New Zealand. 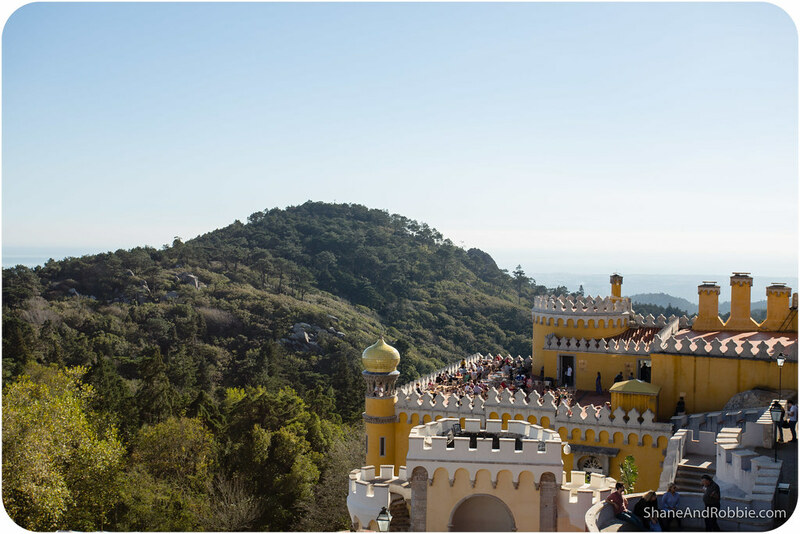 We could have spent a whole day just exploring the park, but as the sun began to drift towards the horizon we decided it was time to head back down the hill to Sintra, then make our way back to Lisbon for our last night in Portugal. 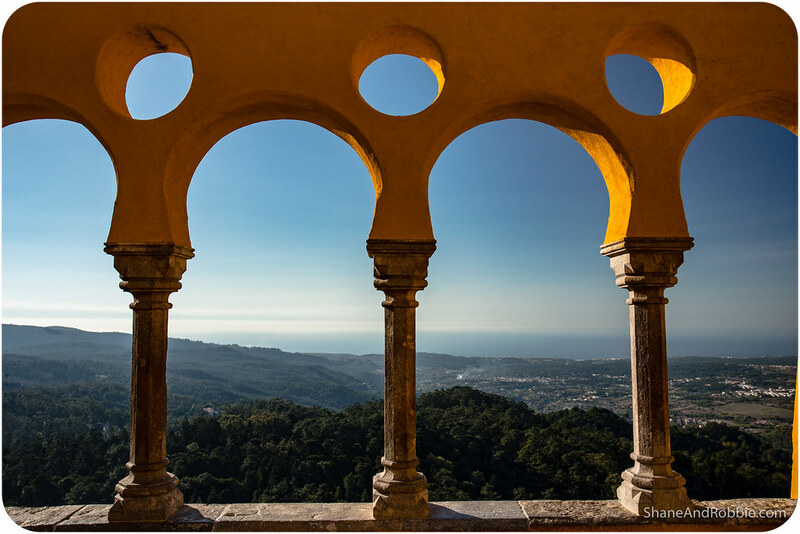 With its stony mountains, exotic forests thick with ferns and lichen, and glittering palaces, Sintra is like something from a fairy tale. We had a great day up there and only wish we had another couple of days to see more of it! 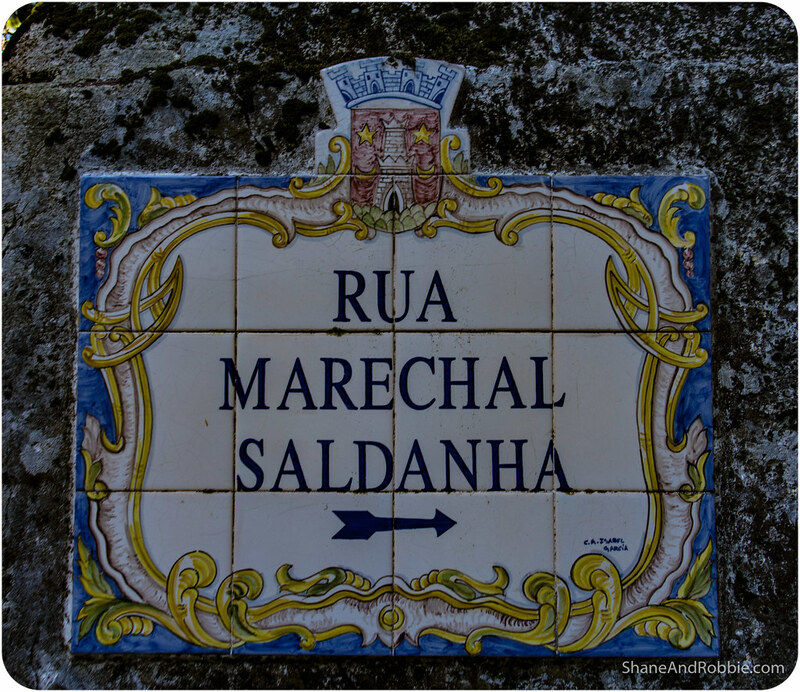 Definitely one of the highlights of our trip through Portugal and a place we will always remember. A great way to end our 2 weeks sojourn in Portugal! 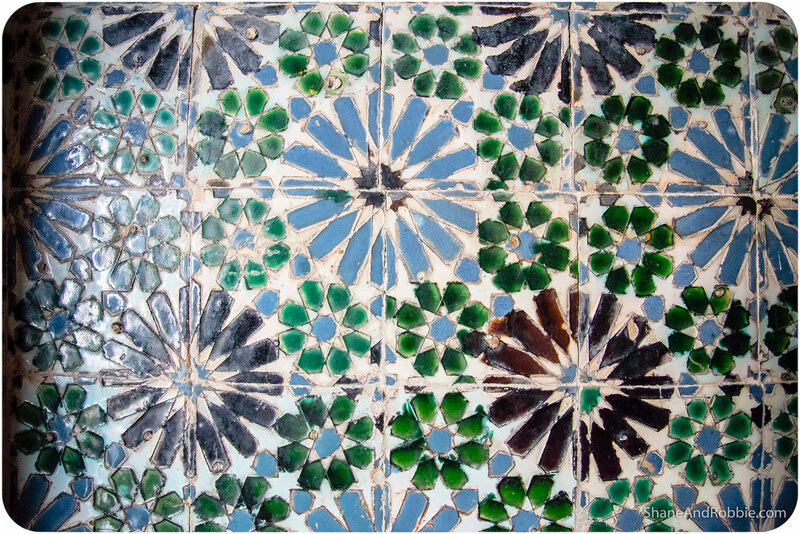 Tomorrow we’re bound for Spain once again, this time set to explore Andalusia and all its Moorish history. 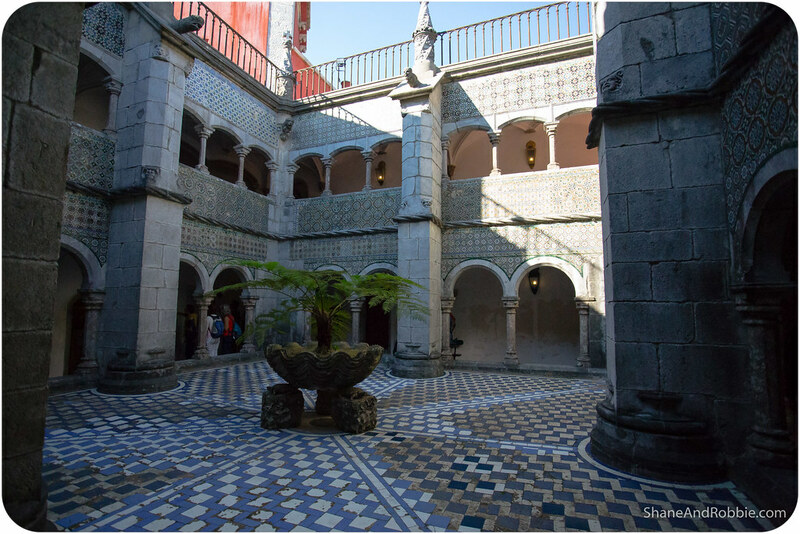 Both of you have a decidedly “Iberian” look & air about you – this is what happens to one when they really get into the “feel & character” of a place. We didn’t see this while visiting China…..